It’s that time again. Just finished a knitting project, a thick pair of socks. What’s next? Usually it flows. But there are times it doesn’t, it doesn’t even trickle, drought time. Yes, they’re huge size 14/15 and yes, if you want to argue that not having woven in the ends does not count as finished, go live in that world. In mine they’re done. It’s not that I have no ideas. But either I don’t have the right yarn, the right mood, the right pattern, the right needles, the right anything. It’s all wrong, wrong, and wrong. And that’s when I start feeling real, real low. Wanting to learn another knitting skill, I checked out Knitting One Below from the library. I love the cool columns that technique makes. A simple scarf is my goal, nothing complicated. First of all, it takes slow color changing yarn, actually that’s a “check” for me. And it takes figuring out the stitch, check, that was a super easy check. The right size needles: lots of searching, since I never have the right size needles.Why not? After all, I have tons of needles and in every size and make. But, they are all on WIPs (Works In Progress) somewhere on the yarn shelves. I settled for what I thought was the right size in wood. I’m not a big crazy fan of wood or bamboo needles anymore. Give me my Signature needles or my Addis. But now the problem: I hate the yarn, especially with the needles. 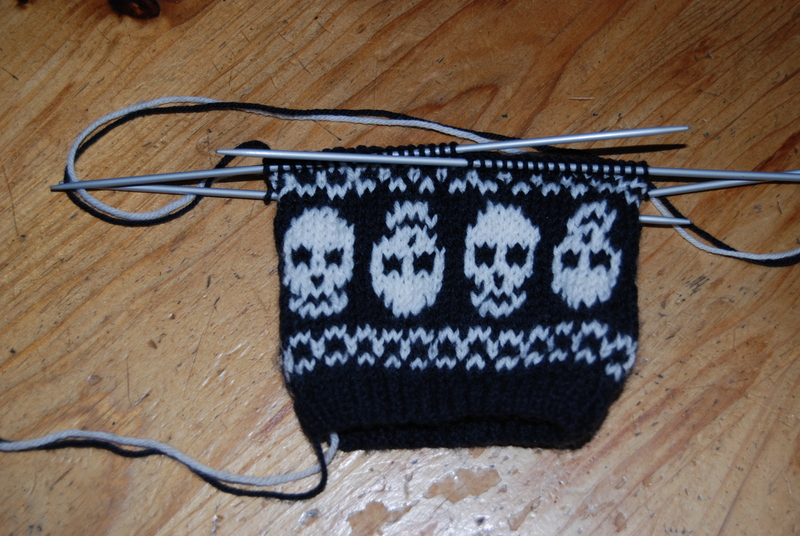 The gauge is wrong, I knit wrong, not tight enough, I cast on too many stitches. Yes, what could go wrong, went wrong. Why could I not follow the pattern? It said to cast on 19 and that it was enough. It did not look enough to me, but 25 are certainly way too many. I love what the yarn does, and at this point if I don’t unravel I’m hoping there’s enough for the length of the scarf. I could do some math with my scale to be sure. 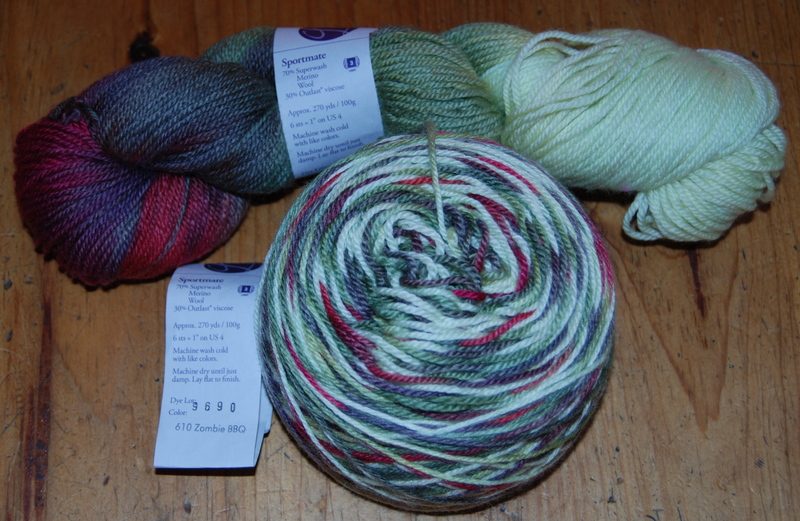 I then took from the shelves about every slow color changing yarn I had 2 skeins of and cast on. That’s depressing, nothing seemed as right as the one above. I have an easier time unraveling after I put a project aside for a while and get some distance from the work I put in it. Sort of the principle of giving birth. If the birth memory stayed too long, there might never be second babies. 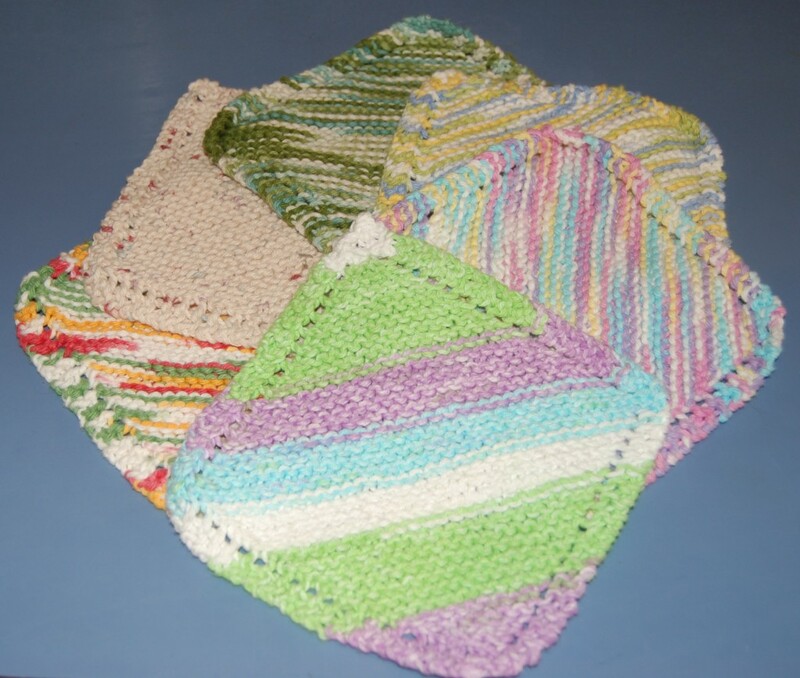 Frustrated, huffing, and puffing, I wove in the ends to a stack of dishcloths. I have no plan yet to lift me up. But I’m working on it. Dealing with lows and downs makes me think of the recent suicide of one of America’s idols. Robin Williams. I got me thinking. Paying so much tribute to someone who took his own life scares me. It’s sort of a validation of suicide. I wonder if the suicide numbers go up after a famous person commits suicide. Corporations use famous people to market their brands. They know consumers want to be like famous people. And using the same brand brings the consumer a little closer. I’m not trying to judge here. Robin Williams must have been in lots of pain, I get that. It’s what we make out of it now. Some call it celebrating his life, but some might have a darker view on this. Just saying…. The saying that getting old is not for sissies seems more true every day I age. OK, right now I have no problems and I’m not complaining. I spent last week with my in-laws in the Bay Area. Both had serious falls with debilitating consequences and needed help. I imagine if that would have happened to them at a younger age they would have walked away from it or been fine within days, but this is taking a toll on their quality of life. I had along the spinning wheel, a basket of wool, and a basket of yarn and projects. Did I need it? Nooooooo, it serves as a security blanket only. Without, I would have yearned for all the knitting I could have gotten done, ha. I did spin every day, but knitting was more of a problem. On the drive down I made a dishcloth in the car. 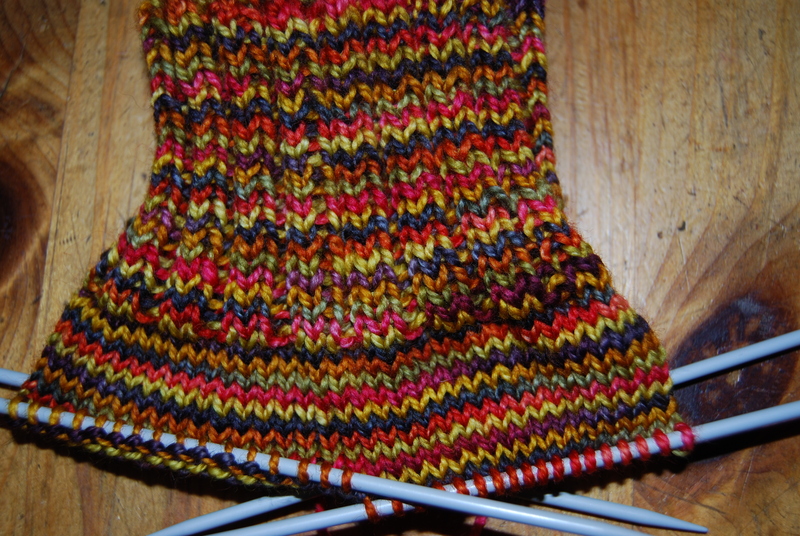 Once there I only managed to knit on a sock, disliking the pattern and frogging the whole thing. Started anew with another pattern but this is on hold too. A facecloth is almost done in a nice organic cotton yarn. Will I learn from that? Again, nooooooo, because how can I anticipate knitting conditions or moods. I might pack lighter with clothing. All I needed was underwear, a pair of pants and a couple of t-shirts. Not 4 pair of pants and t-shirts for the whole summer. They do have a washing machine after all. Swimming was my treat in the evenings. The pool is open until 10 pm and I used the last hour to indulge myself, alone. A whole pool and hot tub just for me. I’m glad we saw the bobcat wandering around on our last day there or I would have been more nervous walking to the pool and being there by myself. But what is a bobcat going to do to me, right? Whatever happened to my youthful invincibility? Did it all get used up? The photo does not do the colors justice. I have never loved colors that much and a name so matching. Then the yarn decided to gift me. A gift I would have embraced with any other yarn but Zombie BBQ. Can you say Christmas, traditional. Let me show you my dilemma. This is so not me, or my daughter, at least I don’t think it’s her. It might be a case of me trying to be cool and hip and again ending up being the dork with the Christmas scarf. The obvious choice would be to frog and start over. But that’s like throwing a gift away, how can I do that? I have posted on a knitting site for opinions and so far every single reply came in as keep it. There is another way to look at this. Skull and XXXs, can you see it? Especially the zigzaggy thing happening in the X.
I’m OCD about the whole affair now and can’t just move on to another project. I have looked at other yarns by the same manufacturer in the same color. Am I crazy? While looking I found colors I might like even more. But, for now I’m stuck. The obvious did occur to me and I have a call out to Liana to see what she thinks since it is for her. Duh! This has been one hell of a difficult week. It started out with back ache on one side last Sunday. Monday I had to go in to see the dentist for another phase of my tooth implant. With back pain. The two hours flew by as if I was having fun. OK, could have been the nitrous oxide. But the week kept on plodding along slowly with a continuous back ache. tried heat, pain meds, from strong to weaker to in between, but nothing helped. I could sit for a little, stand up for a little, and be in bed for longer periods of time. Got nothing done! Just felt sorry for myself. Today came the break through. And of course I probably overdid it immediately. When I don’t want to tackle my mess, I throw myself in to Stephen’s affairs. I flung papers and photos and cassette tapes (yes, he saves cassette tapes, don’t ask, it’s a long story), CDs, dust bunnies and dust buffalos, and after a few hours and repeated complaints by Stephen that he did not sign up for this, his room looked much better. Yes, and so I did kind of, with less vigor, attack my room and all my stuff strewn around the house. To be honest, I only managed to kind of organize my yarn/sewing/craft room. There is a clear path to the table and the sewing machine. And I carried my computer downstairs into our bedroom where I keep a desk that I use as I do all flat spaces in the house, to store stuff on I don’t know what to do with. Actually I cleared the desk top pretty well, but please don’t look behind the curtain of the closet where piles are awaiting me for sorting. I’m hoping I did no further damage to my back because I am ready to knit. Knitting did play a role during the week, if only to finish projects and do very little ones. Let me introduce you to my new hobby: making dishcloths. So far I only have a picture of the first one I made. 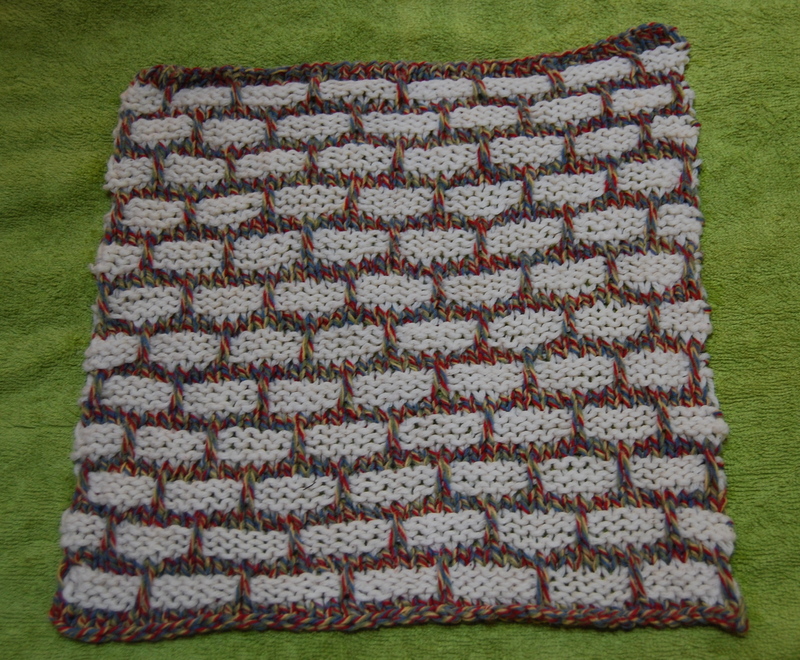 While watching the Champions League soccer match yesterday (Germany against Germany, I could not go wrong), I started and finished another dishcloth. Very unimaginative, your basic dishcloth. 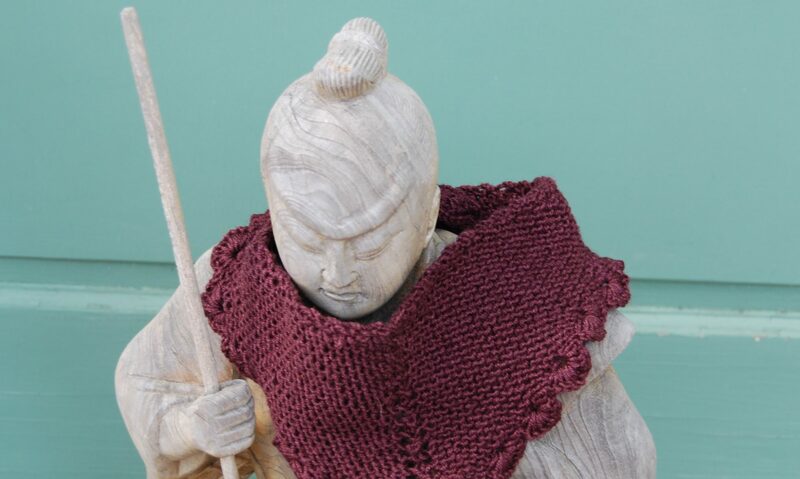 Here is the link to ravelry and the pattern. A friend recently gave me a generous amount of yarn. And I have been dipping into this stash. 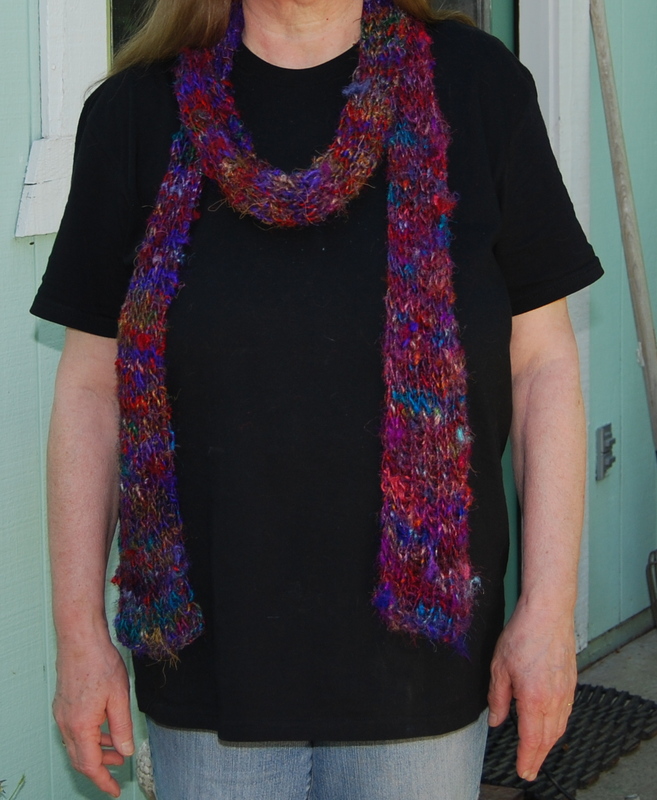 First I used the sari silk yarn. It is a rather heavy yarn, so what to make? I decided on a skinny scarf for our daughter Liana. 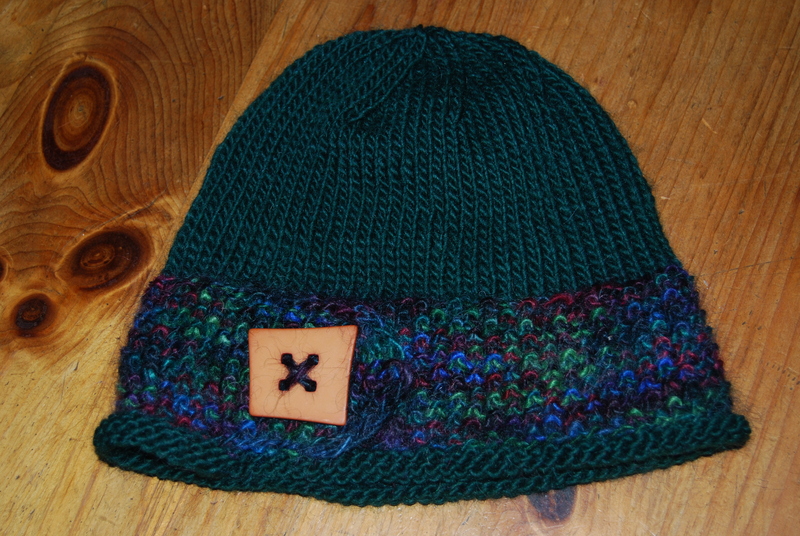 It was not easy to knit with this yarn, it did not move along the needles easily, but it turned out well. This hat pattern is here. As you can see I made a little change by adding a band at the bottom. This was a suggestion by the yarnharlot. The button was an easy find at our local Ben Franklin. And last, but never least: socks. 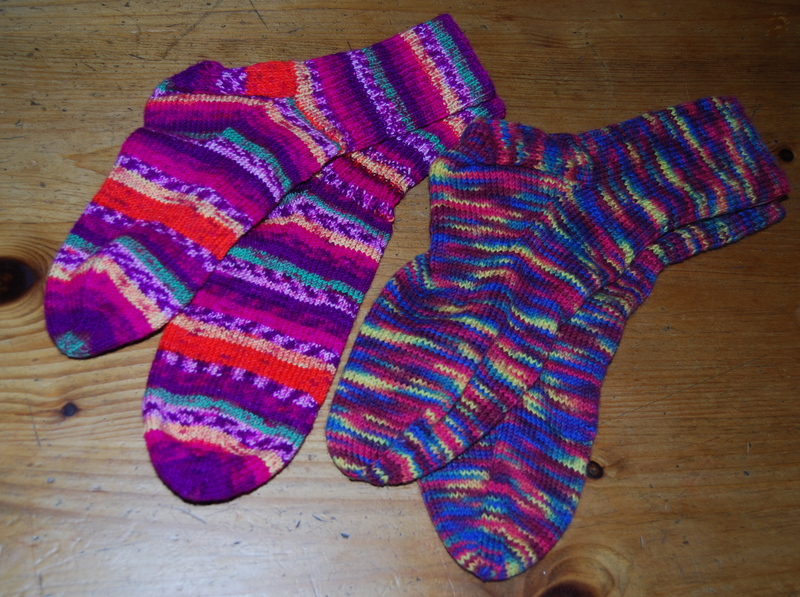 A while ago I finished the non-wool socks for my friend and a pair for Stephen. I’m so blessed that Stephen is willing to wear about any sock in any color I make. I’ve ordered some fleece artist sock yarn recently and fell in love. By accident I ordered a color twice (tiger) and at first was disappointed. 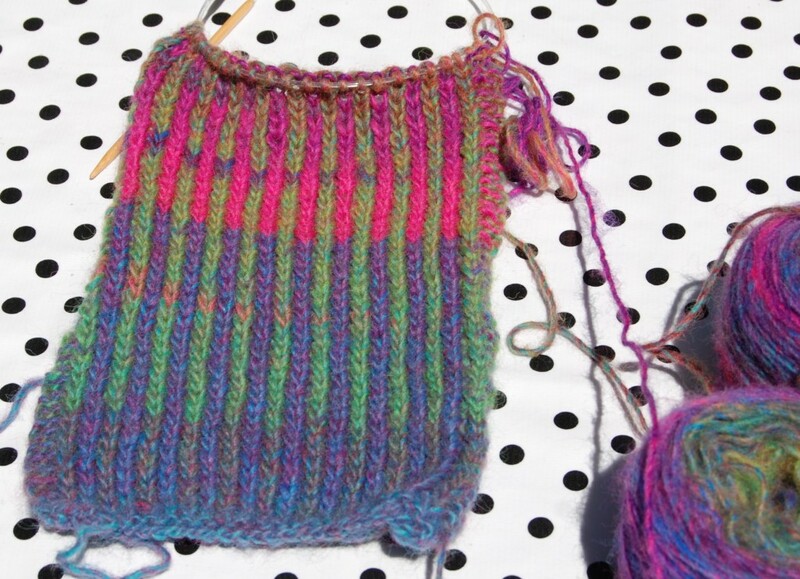 But once I knit with it I realized it was a very happy mistake. I did finish the pair of socks, but I’m having a hard time letting go of them. 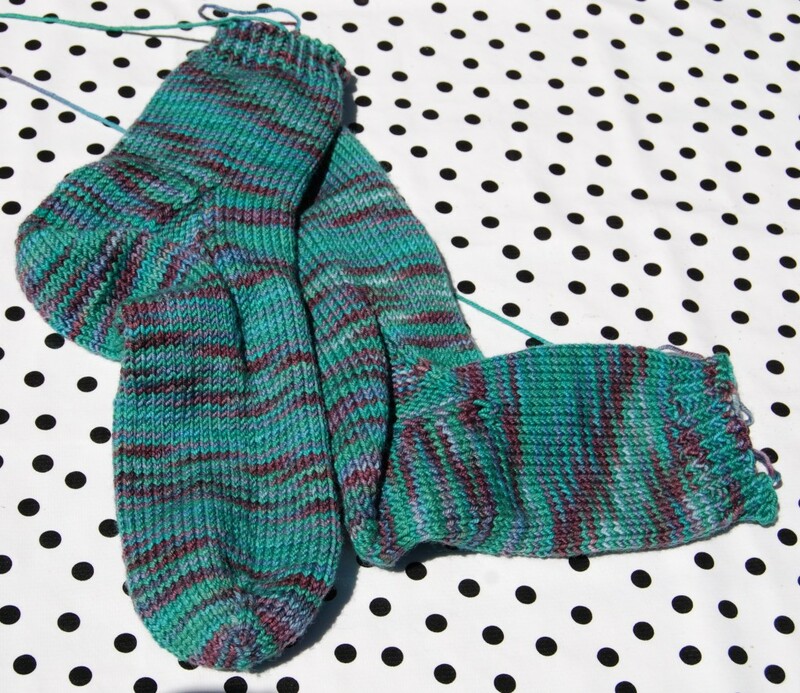 Eventually, perhaps when I knit a second pair, I might be able to pass them on. With that, I’m somewhat caught up with my knitting adventures. There is still a backlog of pictures and projects to show you. For now, excuse me while I go and knit.